Or it can be your floating waterside retreat, with a permanent mooring it can be your own tranquil floating holiday home offering you an available getaway at last minute notice all year round, whilst allowing short trips down the cut wherever you like. Its a great way to entertain - you will never be so popular with friends and family. Foxhangers Marine of Devizes have this month launched a new boat onto the Kennet and Avon Canal which they have designed and built for local couple, Brian and Anne Senior who have been keen to take to the water for sometime. The aptly named Senior Moments was handed over to Mr and Mrs Senior on Saturday 13 October at the Foxhangers Wharf. "There was no room for superstition about the date" said Russell Fletcher, Foxhangers' proprietor "we've worked very closely with our clients for the last 12 months and my boat build manager and his team of craftsman have worked extremely hard to ensure we could be confident about having a successful launch". 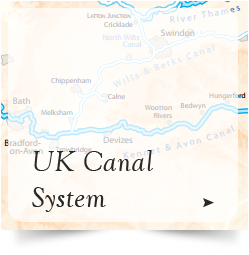 Foxhangers may be best known to people as a canal boat hire company who have had an established business in Devizes since the mid 1990's. Their two fleets of hire boats currently enjoy cruising the length of the canal but in recent years the addition of a dedicated boat build manager at Foxhangers has allowed the business to further develop and expand their canal boat building facilities from solely building new hire boats to the realms of fabricating bespoke canal boats for individuals who want their own floating escape. 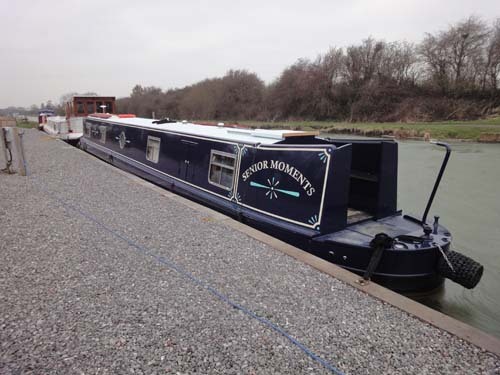 Senior Moments is a 561/2 foot long narrowboat which sleeps 4+2 people. Boat Build Manager Nigel explained that "Many new concepts in boat build design have been used in this project and Mr and Mrs Senior were a pleasure to work with; allowing us to produce a totally unique expression of their taste - ensuring that the contemporary interior of the boat still reflects the traditional style of life on the canal". Used predominantly as a family getaway Senior Moments will be moored at the Foxhangers Marina. Russell and Nigel are proud to have used local suppliers for Senior Moments wherever possible over the 11 months taken to complete the project from design to launch, and anyone interested in commissioning their own boat or for general marine repairs or refitting enquires should contact Russell or Nigel at Foxhangers (01380 827808) for further information or a quote.